Is your boat in need of an interior face-llift? Have you addressed all of the mechanical and safety conerns on your vessel, but neglecyed to also make your boat a comfortable cruising home? Taking the first step toward refurbishing a boat interior is often the most frustrating. Where does one even begin? Which projects should couples leave in the hands of professionals and which can they tackle themselves? This article is an introduction to the subject of interior design. Subsequent articles in the series will guide owners through the process of designing and implementing an interior that works for them. Our goal is to show the options that trawler owners can use to make their trawler more livable. The process of turning a boat into a friendly home-like environment doesn&apos;t need to be complicated, especially when we start off with a nice roomy trawler. Remember, the cornerstone of this trawler life style is about cruising in comfort. We&apos;ve become accustomed to a certain standard of living on land, so doesn&apos;t it follow that we should enjoy the same standard on the water? After all, modern cruising is not about camping in the outback! We should be able to take the things with us that we enjoy, make our life simple, and save us valuable time. Unlike the ancient mariners, boat owners today are able to take advantage of modern, man-made materials-rather than be restricted to teak and brass. So where to we begin? A good starting point with any interior project is defining priorities for how you use your boat. How exactly is it used now? Are you living aboard full time? Is it a secondary residence for extended cruises, vacations? 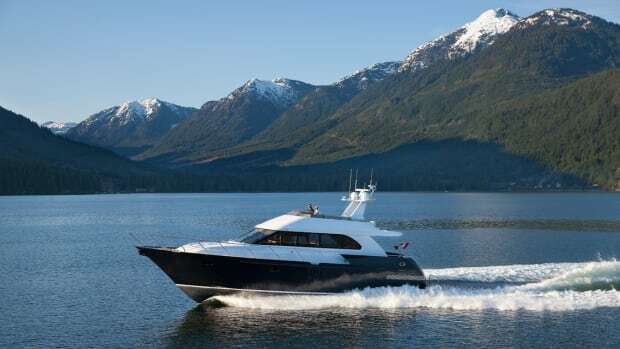 Is your boat simply a weekend get-away? Do you use your boat for entertaining family, friends, or clients? Do you really need accommodations for overnight guests? The answers to all of these questions result in decidedly different priorities. Living aboard requires more onboard storage than for a boat used to marina-hop during the summer season. If the grandkids spend vacation time with you, an extra sleeping space may be important. Do one of you like to cook? If so, galley space and arrangement will be more important for a couple than for owners who always dine in restaurants. Develop a list of the features that you like on your boat, based on how you use it, and also those features that you&apos;d like to change. Don&apos;t get stuck in old habits, either. What once worked may now be obsolete. To some extent, modifications can be made to an existing boat interior to accommodate changes. But if such changes are too dramatic it might be time to looking for a new boat. In a house, when more space is needed, often families add on a room or even a complete wing. Modifications just can&apos;t be done like that on boats without compromising the hull. Instead the solution usually is to buy a bigger boat. What&apos;s your personal style? Everyone feels most at home on his boat if the boat&apos;s design is a reflection of his style. Are you a jeans and Tshirt guy who would be happy watching TV, while sprawled on the floor with your dog? Then you probably wouldn&apos;t be able to relax in a traditional saloon with a teak cabin sole and built-in L-shaped settee. How do you make yourself comfortable living on land? Is your home casual or more formal? The point here is that owners shouldn&apos;t have to give up comfort, and the things they enjoy, just because they&apos;re on a boat. The challenge lies in making it work for them. Also consider preferred maintenance styles. Do the owners enjoy doing work themselves, or is their boat going to be mostly yard maintained? Most people tend to maintain their boat&apos;s interior, but what of those hated tasks? Don&apos;t like to vacuum? Maybe carpeting isn&apos;t a good idea. Would water spots on saloon windows cause mental anxiety? Consider some type of window treatment that will conceal this fact of life on the water. Boats are designed for a purpose: to stay afloat and be able to move through the water. I really am talking about living in a machine. Since the most effective spaces evolve over time in response to need, boats are indeed effective spaces. The living spaces are no bigger than necessary, and often designed to do double or triple duty. The question therefore becomes how to work with this space? Space is probably the hardest design element to change on a boat, yet it is the easiest to manipulate. There are restrictions dictated by the length and width of the boat, but every boat&apos;s interior spaces can be reconfigured, at least to some degree. If owners want to trade space somewhere on the boat that has less importance to their living style, sometimes it is easily accomplished. Let&apos;s say, for example, a boat has a forward stateroom with a V-shaped berth, but there are rarely guests aboard overnight. Perhaps the owners still work part-time, and would prefer a dedicated office area. Why not convert this forward cabin to better fit individual needs? Many have been successful replacing the V-berth sleeping space with a complete office, including computer, printer, and fax. Or a dark room. Or a video film studio. Space can be manipulated with use of color-light colors make a space appear larger, while dark colors visually create smaller, cozier space. Light-color wall coverings will make a saloon look much larger than the traditionally dark, teak bulkheads. When doors and windows are aligned, your eye is drawn through that space and it appears larger as a result. During the day, window coverings can be hidden behind overhead valences creating an open expanse for the eye to travel over. Mirrors can be placed in low-light areas to reflect light back, giving a much more open feel and appearance to the space. The easiest way to transform a boat&apos;s interior, and also the least costly, is through the use of color. This will make an immediate and lasting impression, whether you wallpaper, reupholster, or simply add a new bedspread. It is a basic principle to design: Color can bring a space to life. Color can make a space look cool by using blues and greens, or hot with reds and oranges. Have you ever seen a red engine room? When coordinating a color scheme, everyone has an opinion. There are trends you can follow, or maybe simply decide what scheme you like best. Items that can&apos;t easily be changed, such as countertops, appliances, and wall coverings, work best in shades of white or offwhite. Then use color in those areas that aren&apos;t as difficult to change: upholstery, window coverings, carpeting, and bed spreads. On most modern trawlers, there is a move towards "real" interiors, sized for real people who use their boats in a home-like atmosphere and attitude. People today want to take everything with them when they go cruising-and they want to stay in touch, not drop out. Electronics are therefore an important part of most interiors and need to have places designed for them. It&apos;s hard to navigate with a laptop computer on a range top in the galley, especially if you also want something warm for lunch. Most modern cruising boats have a full array of electronics for entertainment: VCR, TV, CD player, personal computers, and cell phones. All of these things need a place onboard. This doesn&apos;t mean that a boat interior has to become complicated. Rather the reverse is occurring-interiors are becoming more simplified and focused-but this doesn&apos;t mean stark or minimalist. Think effective space with multiple uses or decorative pieces that also have a use. A beautiful platter mounted on a galley bulkhead, for example, may also be used as a serving dish for a special meal aboard. A decorative wooden box may also be a dandy place to store CDs. There is also a movement toward the use of lighter colors. This is evident in some trawlers as lighter maple and cherry woods replace traditional yachty, but dark, teak hardwoods. Even light-colored, fabricated fiberglass "paneling" has been successfully used to brighten living spaces, with the teak and mahogany hardwoods used mainly for trim. It seems clear that gone are the days of the dark main saloon, with teak paneling and trim, wood blinds on the windows, and hardwood flooring. Many owners of older trawlers are now starting to use lightcolored wall treatments and installing carpeting over those dark hardwood cabin soles. The resulting look is outstanding and knocks years off the age of the boat. When you have the opportunity to go aboard a new boat these days, or read a boat tour in PMM, look at the new treatments being used. Could this be translated for use on your own boat? Even modern trends for homes can be studied and sometimes successfully implemented on a trawler. Just keep in mind three basic thoughts: Is it your style, will it hold up in a marine environment, and will it make life easier for you? Some boat owners have no problem tackling most boat projects-given the time, the right idea, and access to the appropriate materials. However, if you do not have the time, or don&apos;t have the skills necessary to complete a project, working with a professional may be an alternative worth exploring. With some projects, such as installing a new carpet, you may just need to find a contractor familiar with working on boats. If you decide to work with a designer, select one who has worked on boats and is familiar with the cruising lifestyle, as well as the demands of the marine environment. You don&apos;t want to work with a designer who may have some great ideas on paper, but whose ideas can&apos;t possibly be executed for use on a boat actually going cruising. Just because the person may have created a fabulous interior for your home or office doesn&apos;t mean they will understand life on a boat. Design elements and installations of treatments are very different on the water. If there is some difficulty getting started, it may be helpful to initially work with a decorator or designer on a plan and design. Such professionals should be able to provide preliminary sketches and a sample board (the different fabrics and materials to be used) for a design fee. Having an objective person look at the layout and ultimate use of your boat is often beneficial. Decorators are constantly exposed to the new fabrics and materials that come on the market, and they can often suggest a direction that you never knew existed. Think about it: A boat interior consists of certain simple elements. Withholding nautical terminology, we are faced with covering floors, walls, ceilings, windows, and furniture. And the galley, head, and storage areas all have their own unique concerns. Throughout this year we will guide readers through these different elements to make your boat a better place to be. What is this going to cost? Probably less than you think-and definitely less than the cost of a new engine!